There is a large soft tissue mass occupying the cranial thorax, displacing the heart caudally and dorsally. 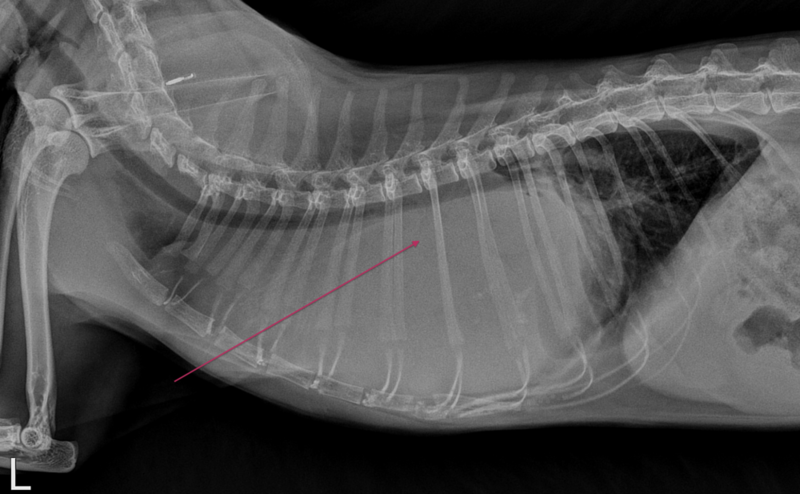 The trachea is also displaced dorsally. The cranial lung lobes are still visible cranial to the mass and are slightly increased in density. The diaphragm is intact and the portion of the abdomen included appears normal. The findings are most compatible with a cranial mediastinal mass, and thymoma would be considered as the most likely differential diagnosis. Thymic lymphosarcoma could have a very similar radiographic appearance, and usually a biopsy is required to definitively diagnose the tumor type, as aspirates are often inconclusive. No biopsy was pursued in this patient, but ultrasound showed a mass with characteristics typical of thymoma. The annotated image below indicates the direction of force exerted by the mass on the other mediastinal organs, which can be helpful in trying to identify the origin of the tumor in a case like this.